In September 2015, a new master's program has successfully started at the Moscow Institute of Physics and Technology (MIPT). Now we are looking for fresh motivated students who wish to apply for the same program in October 2017! 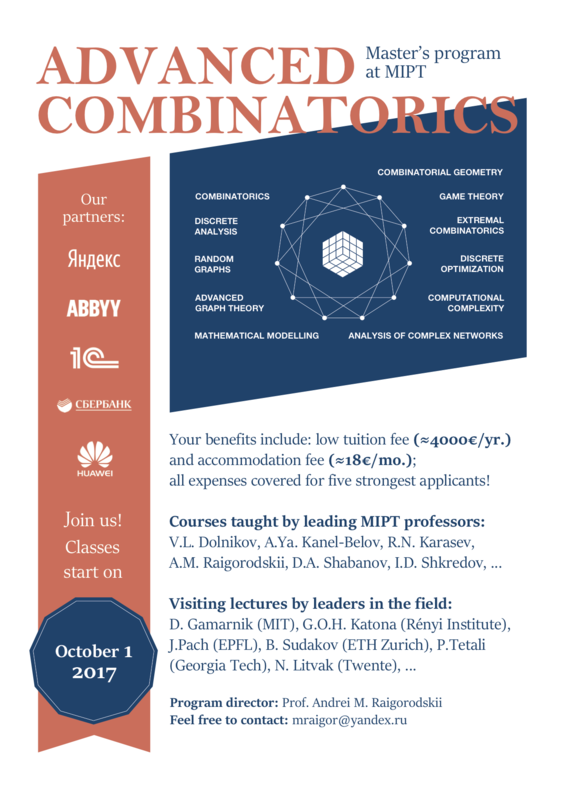 The program is focused on modern aspects of combinatorics (or, a bit more generally, discrete mathematics) and its applications in computer science and in the theory of complex networks. Below we provide a list of courses, but first of all we would like to emphasize the features and competitive advantages of our master's program. The program is 2 years long. All courses are taught in English. The program is completely free for 5 strongest applicants selected by the program committee. Moreover, a stipend of 5000 Russian Rubles will be paid monthly in this case. Additional scholarship will be available. The program welcomes any additional number of students selected by the committee. The annual tuition fee is as low as 4000€. Moscow Institute of Physics and Technology (MIPT) provides every student with accommodation in modern buildings on campus. The monthly apartment rental fee is only 1250 Russian Rubles, which is about 18€. MIPT helps with obtaining a Russian visa and getting a health insurance. Besides courses by strong lectors from MIPT (including professors V.L. Dol'nikov, A.Ya. Kanel-Belov, R.N. Karasev, A.M. Raigorodskii, D.A. Shabanov, I.D. Shkredov, et al. ), we also have leaders in the field from the renowned scientific institutions as visiting lecturers. Among them are D. Gamarnik (MIT, Boston), G.O.H. Katona (Renyi Institute, Budapest), J. Pach (EPFL, Lausanne; Renyi Institute, Budapest), B. Sudakov (ETH Zurich), P. Tetali (Georgia Tech, Atlanta), N. Litvak (Twente). This is a really unique combination! We have strong partnership with many renowned combinatorial research centers all around the world. Among them are: MIT Boston, Renyi Institute Budapest, EPFL Lausanne, Tel-Aviv University, ETH Zurich, INRIA France, Cambridge University UK, UCL UK, Technische and Freie Universities Berlin, Georgia Tech Atlanta, and many others. Thus, we can help our students who successfully finish our master’s program not only to become PhD students at MIPT, but also to apply for graduate studies at the above-listed partner institutions. The department of Discrete Mathematics at MIPT, which is organizing this master's program, not only employs prominent professors listed above, but also has well established partnership with Yandex, the most popular search engine in Russia. Professor Andrei M. Raigorodskii, head of the department and director of the program, is also the leader of a research division at Yandex that aims at applying combinatorial methods to provide good models for web-graphs and to improve search quality. Thus, our students have an opportunity add an internship at Yandex research labs to their portfolio. Although our program covers the state-of-the-art advanced modern combinatorics and applications, we shall certainly spend some time in the first semester to introduce our students to the basics of the subject. The fourth semester is solely devoted to research and master’s thesis preparation. To apply for our program, firstly please write a letter to Professor Andrei M. Raigorodskii, the program director. His e-mail address is mraigor@yandex.ru. To your letter, you should attach your CV including places wh ere you have studied before or worked before, a description of courses in mathematics and computer science that you have taken, and any other information that is relevant to your academic background. Letters of recommendation (at least two) are needed. Basic knowledge of combinatorics, probability, calculus, and linear algebra is desirable. An interview with an applicant will be organized via Skype, Hangouts or other teleconferencing software.